Mission Statement of Living Hope Ministries. 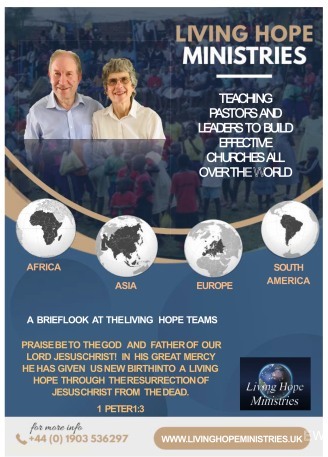 Living Hope Ministries exists to build the church through teaching and informed advice, training and evangelism within a network of churches and leaders in the UK, Africa, Europe, Asia and other regions as called. Speaking to groups both large and small, in churches, mission halls, seminars and evangelistic crusades. Gathering pastors, providing lunches and teaching them a deeper understanding of the word of God. The needs are too many for one man to cover, so people from many churches and countries volunteer to support the work by going on Mission with Living Hope Ministries. These go into Africa and Asia and also the UK via satellite radio channels. These programmes are seen in Kenya, Uganda, Nigeria and India. The India station also reaches into other parts of Asia. The LHM International Leaders Fellowship works by email. We share prayer requests and agree to pray for one another on the first Friday of each month. Regular visits to 30+ churches, to update people and to encourage prayer and giving. Some churches also send their own people on Mission with Living Hope Ministries.